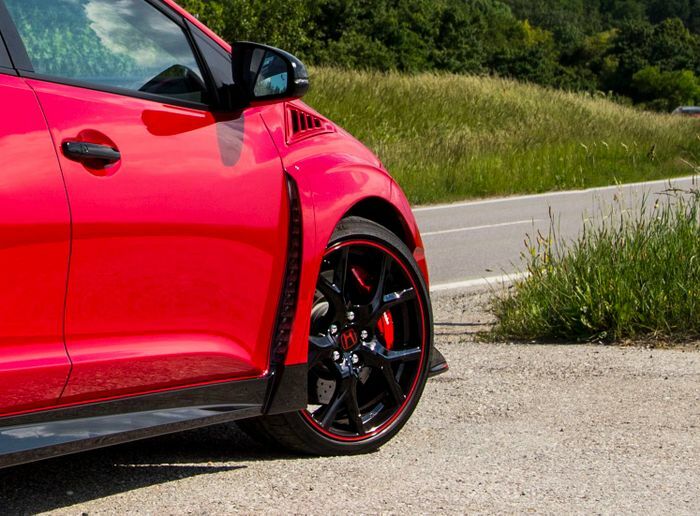 The aerodynamic package on the Type R goes far beyond what you’d usually find on a hot hatchback. Honda says that none of the bonkers aero bits that give the Type R its love it or hate it exterior have been added for the sake of it: everything has a purpose. At the front, there’s a chunky splitter which - along with the side skirts - is designed to reduce lift and manage airflow. 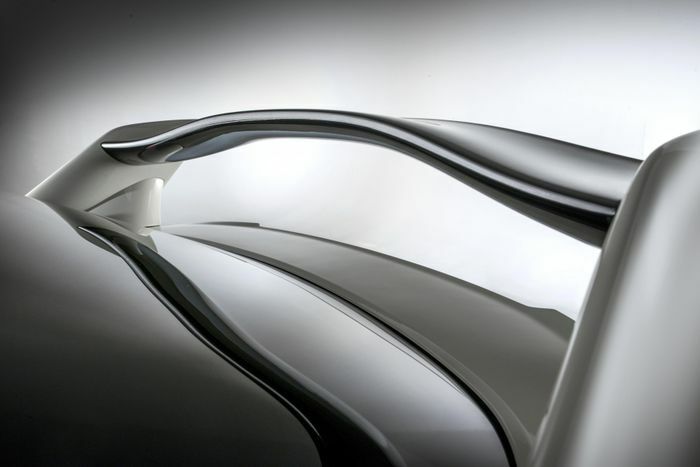 The front bumper has a very specific shape which reduces turbulence around the front wheels, helping high-speed stability. All this results in the Type R being the only car in its class which actually generates negative lift. And after driving it around the tricky Slovakiaring while trying to retain bowel control during the car’s international launch, I can tell you it feels very stable in high-speed corners. Once the preserve of very exotic motors, adaptive dampers have filtered down to this much more affordable end of the market. 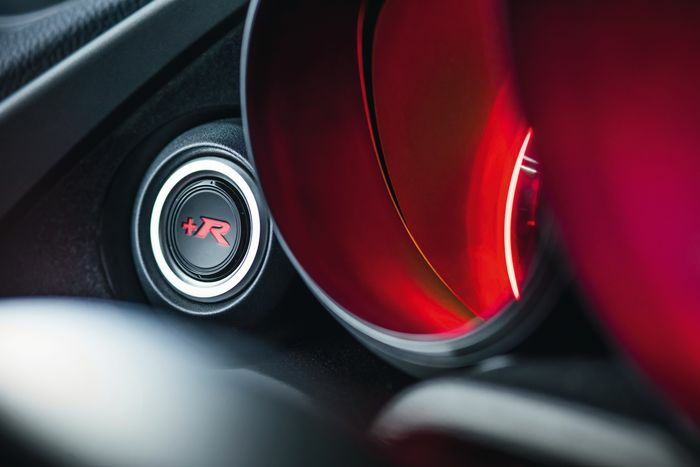 As such, it’s no surprise plush dampers make their way onto the new Type R, fitted as standard. The adaptive dampers use sensors which take readings every 1/500th of a second, adjusting the firmness of the dampers independently by altering the current to electromagnetic coils to change oil flow. It’s also possible to stiffen the dampers by 30 per cent by punching the +R button. This means the standard mode can be a little more comfortable, giving a ride that’s not quite as spine shattering as the old FN2 Civic Type R.
At the rear of the Type R you’ll find a torsion beam suspension setup, but don’t panic about it not being fully independent. First off, just look at the Renaultsport Megane: it’s the sharpest-handling car in class - just pipping the Honda by virtue of better driver feedback - and second, it isn’t an ordinary torsion beam on the back of this Civic. The H shaped torsion beam member is made from crushed pipes rather than a solid block, improving rear roll rigidity by 177 per cent. Because of this, the designers decided the car didn’t need a rear anti-roll bar, so there isn’t one, which means less weight. 306bhp and 295lb ft is a ludicrous amount of power to expect the two front wheels of a car to handle, so there are countermeasures at play. There’s a helical limited slip differential and a system called Agile Handling Assist which brakes the inside wheels during cornering to tighten your line. However, what interests us most is the ‘Dual Axis Strut’. 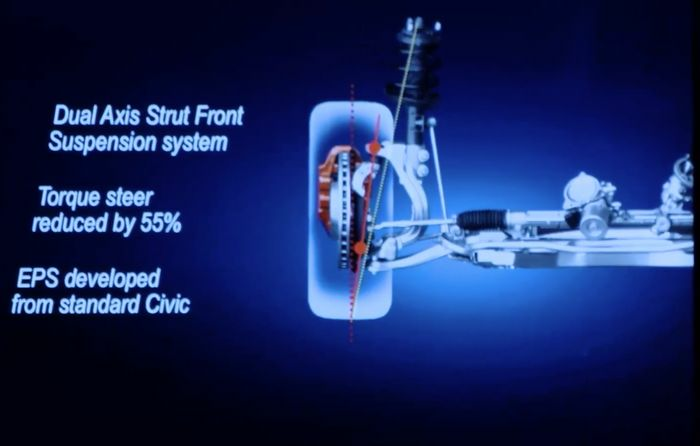 If you’ve read anything about Ford’s RevoKnuckle setup, you’ll get a sense of deja vu, as Dual Axis Strut uses a similar design. Whereas conventional MacPherson strut designs feature a steering knuckle integrated with the strut, Dual Axis separates the two. This separates out the steering and suspension forces, and aids geometry by allowing for a smaller wheel centre offset. The result? A 55 per cent reduction in torque steer. The system is also supposed to increase steering feel, although in practice the Type R’s steering isn’t the best in terms of feedback. It’s quite common for high-performance turbocharged cars to feature either two single scroll blowers, or single twin-scroll unit. Either of these options help counter turbo lag, but the Honda has neither: it’ uses a single, mono-scroll turbo. 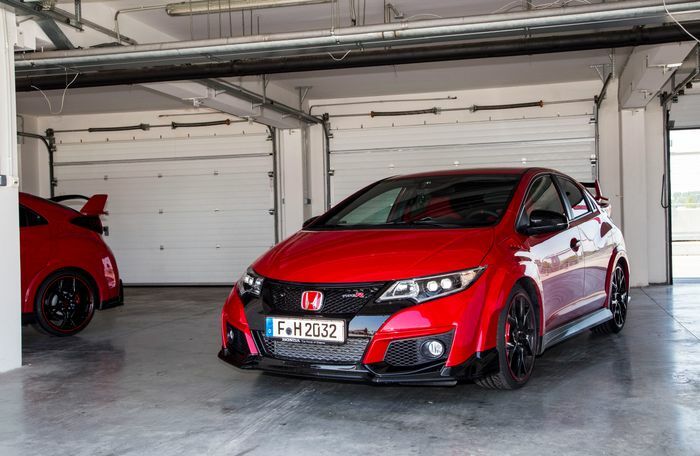 Instead, the new Type R’s 2.0-litre unit uses VTEC to combat lag. VTEC - or Variable Timing and Lift Electronic Control - is something we’re used to seeing on hot Hondas, but before it’s been about giving a boost in the last few thousand revs (seeing you change up at anything up to a frankly silly 9000rpm in some VTEC’d Hondas). Here, its primary function is to do the opposite, by giving a higher valve lift at low revs to boost low-end torque. Has it worked? To an extent, but there’s still some obvious lag. However, the engine’s boosty attitude as the turbo comes on song at 3000 or so RPM is damn good fun to experience. 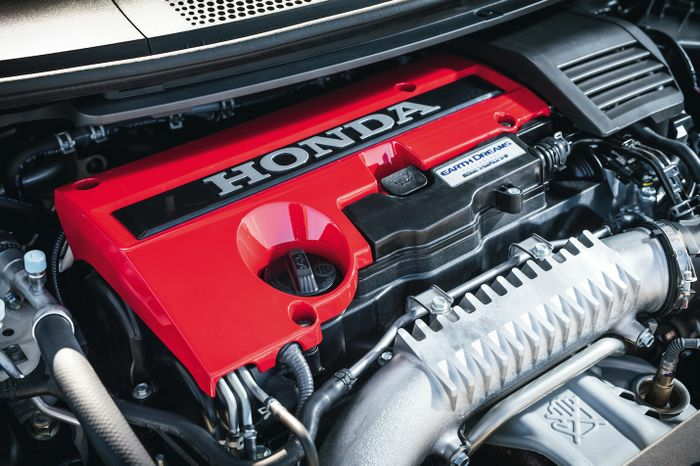 With a fairly big turbo engine stuffed transversely into what’s a not particularly large engine bay, cooling was an understandably important consideration for Honda’s engineers. In addition to obvious solutions like a larger air-to-air intercooler and bigger vents at the front, there are also vents behind the front wheels to let hot air escape. Air is channeled into the grilles at the front, through the engine bay and out of the wheel vents. Want more Type R content? Head over here to check out our full review of the car.